This sedate looking scene of the St John’s end of town shows a horse and cart heading towards the direction of Warwick, watched over by an elderly gentleman in a top hat. A lady in fine attire and an elegant hat walks alongside on the pavement. A child in a smock is ambling along in the middle of the road, a pursuit which wouldn’t be encouraged today! A gas lamp stands at the centre of the cross roads. 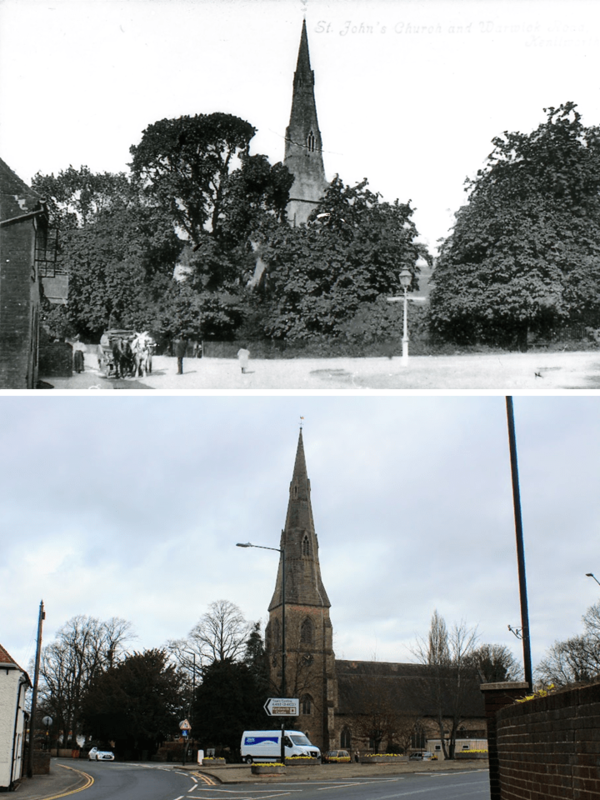 Then, as now, the railway runs past the rear of the church but when the ‘then’ photo was taken there were fields between the railway and Windy Arbour. According to the St John’s church website, the foundation stone for the church itself was laid in August 1851 and the church was consecrated in 1854. The website adds that the church was built “for the princely sum of £5,000 to cater for a growing class of artisans, who may not have been overly welcome elsewhere”, which perhaps provides a little glimpse into the social history of the area at the time compared to the much older parish of St Nicholas to the north. Some recommended reading regarding the St John’s area must include Paul Byron Norris and Arthur Frodsham’s book Jackender (Odibourne Press, 1995), so named after the nickname ascribed to the people of the parish, as opposed to Jackdaws (castle area) and Moorhens (Mill Enders). Similarly, Peter Ashley and Graham Gould’s book Another One is Born (published by Peter J Ashley and © Graham Gould, 2011) gives a vivid account of the unique community of St John’s from 1930 to 1960. The area was not short of a pub or two. Out of shot to the right of the photo, in what is today Camden House conference centre, was once the Horse & Jockey. Just behind the smithy was the old Malt Shovel, which closed in 1923 and is today a residential cottage displaying the name on a plaque beside the front door. A little further on, of course, is the Green Man which today operates under the Ember Inns brand in a somewhat tamer incarnation of its former self.